With Bourne End I’d reached the point where the Thames Path was beginning to make like difficult. Well, not the Thames Path itself. It’s not like it suddenly started heading up mountains, or required traipsing over boggy moorlands or anything. It was more that the places that the Thames was now visiting, simply didn’t have the best train services. Bourne End was a prime example. Its railway station is tucked up a small branch line running from Maidenhead, with services that run roughly once an hour for most of the day. Miss your connection and you’d be in for a long wait in a draughty waiting room. Getting there also required a lengthy journey to get there; over two hours travelling from my house. 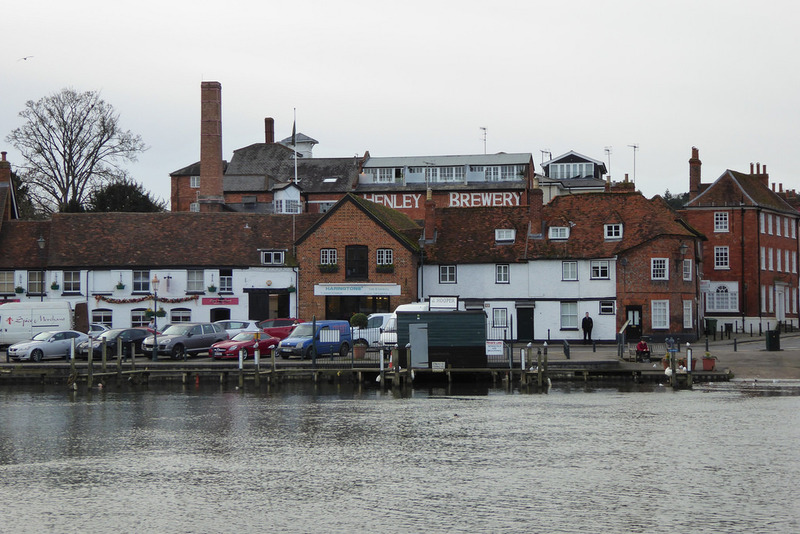 And heading back from Henley, where I would be walking to next, would then need a further two hours. It was more than possible that I’d spend almost as much time travelling as I would actually doing the walk. And if I didn’t set off at a reasonable time in the morning, the sun may well set before I’d finished. So when I returned to Bourne End the following week I was determined that I would a) leave the house early, and b) I wouldn’t miss my train. I’d almost been set up to fail from the outset. When I’d putting my journey plans into the National Rail website, it had dutifully returned me some plausible looking results. Great, I thought, jotting down the train times.. Only later did I realise that it had given me a mere three minutes to change trains at Maidenhead. Three minutes to get off the train, run down the subway, up some steps and onto platform five for my connection. Even normally that would be a tall order, but it would simply take my London train to be delayed by, oh I don’t know, let’s say three minutes, and I would be right royally screwed and would be spending ages sitting on a cold bench, wondering why waiting rooms can never be made nice and cosy. I adjusted my plans accordingly, and shoved an extra ten minutes onto my journey time. All of which was why I found myself forced out of my bed at the unearthly hour of 6am, on a tube train by seven and crawling out of Paddington on a so-called “semi-fast” train by ten past eight, having managed to arrive at Paddington early enough to not only pick up my tickets but avail myself of a scorchingly hot, but far too weak cup of tea for the journey. Apart from the train speed, the plan was going swimmingly. So swimmingly that I managed to arrive at Maidenhead twenty five minutes early, and spent ages sitting on a cold bench, in a draughty waiting room at Maidenhead. Oh and in my rush to leave the house, I’d managed to leave my Thames Path guide book on the dining table back at home. Bourne End wasn’t a particularly big place, and I soon left it behind; strolling along through muddy fields, bordered by the Thames on one side, and the railway line to Marlow on the other. Signs at the entrance to the field warned that cattle may be grazing on it, however the cows were somewhere else – perhaps somewhere far warmer – and the field was mostly occupied by dogs and their owners instead. If someone ever decided that the Thames Path needed its own “official animal”, then the canine would surely be a strong contender. Yes, perhaps the otter, goose, swan or duck would be a more natural voice, however I defy you to walk the Thames Path and see any creature in greater numbers than that of the domestic hound. It was clear that they’d taken to the river like a, well, a dog to water. Without my guide book, I had little idea of where I was going and what to expect. All I knew was that Henley was somewhere down the path. Not that I felt particularly worried by this. 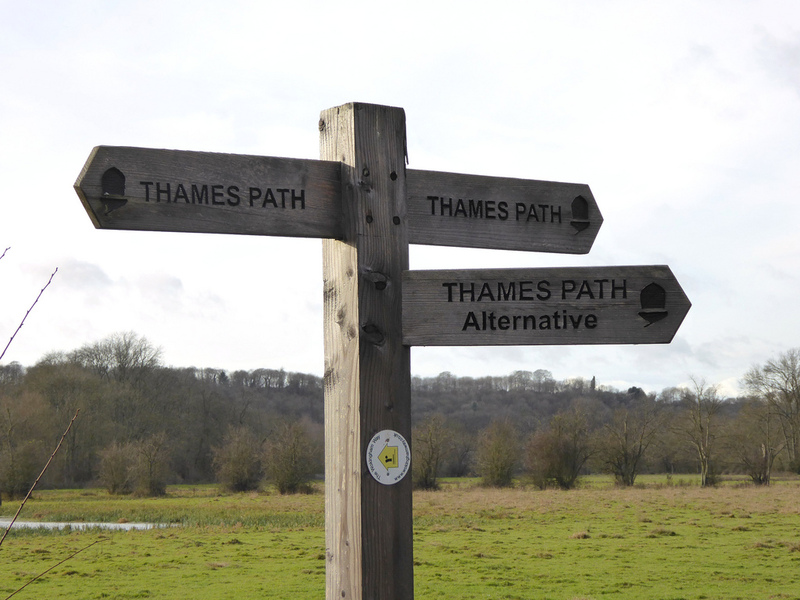 The Thames Path is pretty well signposted, and it’s hard to get lost. So much so that I’d barely ever used my guide book for navigation. However, it would have been nice to know what I was seeing, and how far everything was. A prime example was that I was heading to Marlow. In my head, it was a four mile walk there from Bourne End, Yet I arrived at its outskirts in barely an hour. Given the path had been mostly consisted of mud – the sticky, gloopy kind that you slide around on, and which forms a deep attraction to your hiking boot resulting in your boot heel growing by at least an inch for every half mile you walk – it seemed most unlikely I’d been walking fast enough to cover off four miles in that time. The tow path disappeared again at Marlow, and the Thames Path was sent down a series of streets and even an alleyway lined with huge brick walls, before popping out in Marlow’s main street. The village seemed a pleasant enough place, with a grand sign on a small green proclaimed that it had been awarded the coveted title of “Buckinghamshire Best Kept Village” several times between 1987 and 2009. Neat and tidy it may have been, but the main road through the village was heaving, full of traffic heading across the river. 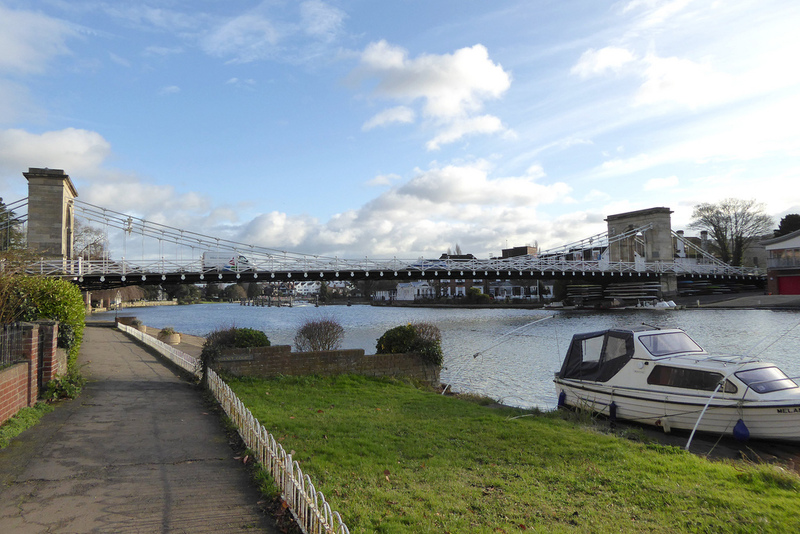 The bridge however was Marlow’s crowning feature. Opened in 1832, it’s the only suspension bridge to cross the non-tidal part of the River Thames, and the design was used as a basis for the Széchenyi Chain Bridge in Budapest. It’s a wonderful looking structure, best appreciated from the river rather than from a car seat. Smart, elegant, and an asset to the area. One that had almost been razed to the ground – or water – back in the fifties, in favour of a four lane concrete super-highway. Marlow had had a fortunate escape. After a gloomy start, the sun had come out and was shining brightly. It was a perfect example of winter sun; sitting low in the sky and dazzling anyone who just happened to be walking in the same direction as it. Like people such as myself. This was most unlike what the news had been predicting. According to news, we were supposed to be in the middle of a “weather bomb”. I wasn’t entirely sure what that meant, but it was important enough that several newspapers seemed to be spelling it in capital letters. The Daily Express had been getting especially hysterical about it, with an especially doom-laden front page, screaming about how people were going to die, with a sub-heading of how the Ghost of Diana was especially concerned about it. Or something similar. I didn’t actually bother looking at it properly, but it’s always something like that. Besides, I was too busy worrying about the fact that as well as leaving my guide book at home, I’d also left my gloves there too. The sun may be shining bright, but a cold wind was making my hands rather cold. An arched wooden bridge transported me to the other side of the river, and then the Thames Path provided a treat. It went onto an island. I’d passed many islands on my way up the Thames. Some had hotels on them, others houses or commercial premises. Many had none, and were completely unpopulated. There were those that could be got to by bridge, those that had effectively been merged into the mainland, and those which you could only access by boat. But generally they all shared one characteristic: they were private property, and the casual walker need not apply. So the crossing of the Thames Path onto Hurley Lock Island was a momentous occasion. Okay, it wasn’t a real island. 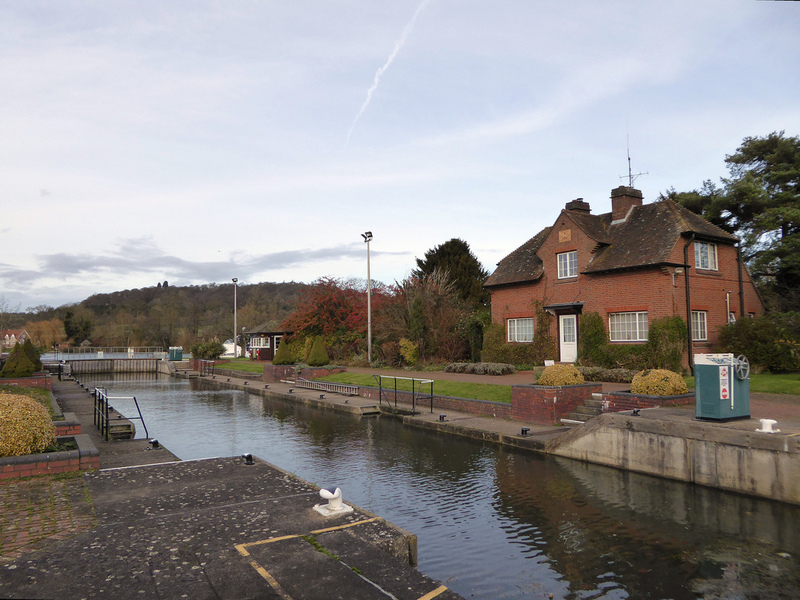 Hurley Lock Island was an artificial creation, a by-product of the building of the lock. Even so, it was cut off from the river bank, accessible only by bridge. 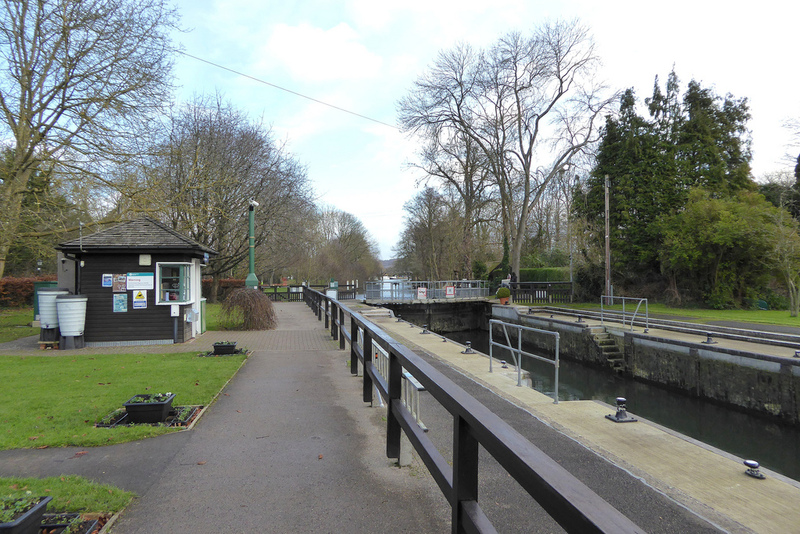 Generally even lock islands are off-limits unless you are the lock-keeper or a boat user, but here the Thames Path made an exception and hoped over. And there were several other bona fide islands in the vicinity too. A map besides the lock showed that most were private, but that one could be accessed as it was a campsite. To get on it, all you had to do was say hello to the lock-keeper, and get a ticket. Oh and it needed to be between April and October. I checked the date. 11 December. Rats. I’d have to come this way again in the summer. Camping on a Thames Island was too good an opportunity to miss. 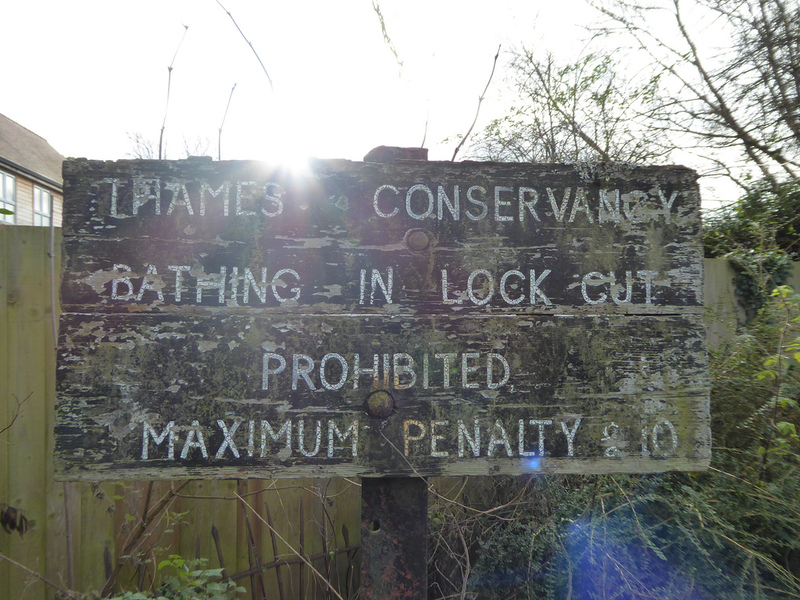 Back on the mainland a faded sign warned that anyone bathing in the lock would be liable to a ten pound fine – which I’m sure puts off many a wanna-be bather – and further along, another sign let it be known that anyone dreaming of having a picnic in the area would be charged £3. I resolutely stuck to the path, and avoided eating any food as I walked along, lest someone leap out and try to take a couple of quid off me. The picnic area was totally devoid of people scoffing sandwiches. Perhaps the charge was putting people off. Or the fact that it was nearly Christmas and thus hardly prime picnic season. The fields were empty except for a large flock of geese who filled one of the fields, casually blocking the path as I tried to walk along it. The river bank had collapsed further along at Frogmill Spiney, resulting in the path being diverted down a private road lined with park homes – the kind of distinctly more permanent looking buildings that can sometimes be found on caravan parks – and then it was back on the river once more, where I was confronted by a signpost offering a choice of the “Thames Path” or the “Thames Path Alternative”. I’m always slightly suspicious of anything labelled as an “alternative route”. I always get that feeling that someone’s trying to stop me using a legal right of way. Whilst walking the Coast to Coast some years earlier, I’d arrived at a farm to be confronted with two paths – one going left, and the other to the right. The one on the left had been adorned with five or six arrows, as is to emphasise that someone really wanted you to go that way. Yet the one on the right, with its waymark almost hidden, was the one that was the legal right of way. As it turned out, the one that someone clearly didn’t want people to take, took the walker swiftly and directly through a farmyard, whilst the route on the left resulted in a huge detour through an insanely muddy field. If I’d had my map with me, I would have seen that the “Thames Path Alternative” was a path that stuck to the riverbank, whilst the Thames Path itself took a slight shortcut across the field. I still stuck to the main route though, thus saving a few metres of walking. 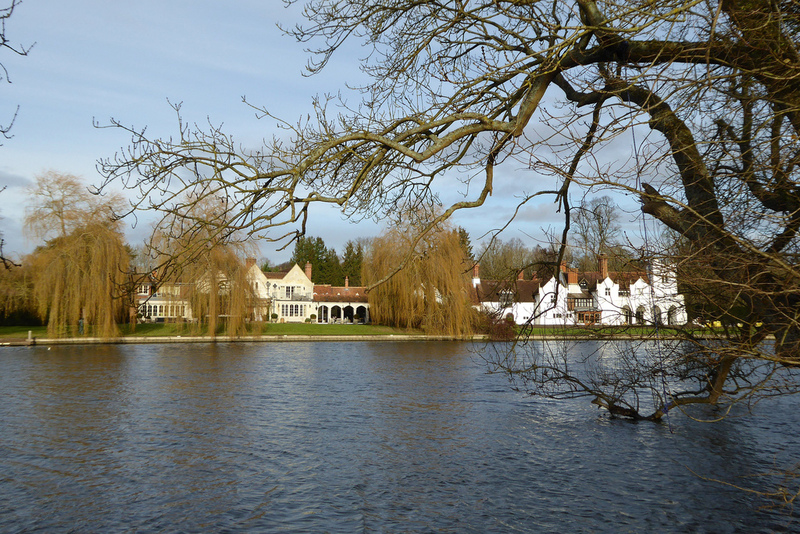 It didn’t particularly make much difference in itself, although did perhaps deprive me of the best view of Medmenham Abbey on the opposite bank. Until the dissolution of the monasteries, the site had housed a Cistercian abbey, but it’s the site’s post religious use that gives Medmenham Abbey with its fame. Under the ownership of Sir Francis Dashwood the buildings housed the ‘Friars of Medmenham’ club in the 18th century. Later becoming known as The Hellfire Club, the club’s members met to engage in drunkenness, banqueting, debauchery and various acts of a sexual nature with hired female “guests” for several years until it all ended in 1766. These days its just a white building. But a nice looking one. In the grounds of Culham Court, the Thames Path headed inland, crossing through fields of a deer park, and to the foot of the 18th century manor house. Until recently walkers had been able to follow a permissive footpath which stayed closer to the Thames, but 2012 access rights were revoked; an interesting decision given most property owners seem to prefer keeping the public as far away from their residence as possible. For once it was nice to be away from the Thames. So often, diversions away from the river saw the Thames Path shunted down alleyways, or along roads. But here it went along a nice grassy path, slightly raised up, providing affording a fine view of the river and the surrounding area. Nearby I noted with interest a field that had been curiously mowed, with immaculately cut concentric circles and a kind of hatch pattern in the middle. Culham Court’s owned by a Swiss financier with a wealth estimated to be around £850m, and I guess he has to spend his money somehow. I headed through the hamlet of Aston, home to the appealing looking Flower Pot Hotel, who proffered Brakspear Bitter and “accommodation for fishing and boating parties.” It looked like it would be well worth a visit; giving every impression of being a perfect rural inn, and thus kind of place I knew I couldn’t go into because if I did, I’d be there sampling the ales for a couple of hours, and would never get to Henley before the sun went down. The Thames Path returned to the river a short way on, just before arriving a lock and a grand view of Hambledon Mill on the other bank, where a waterwheel powered the mill for centuries until the advent of electricity ultimately caused its demise. 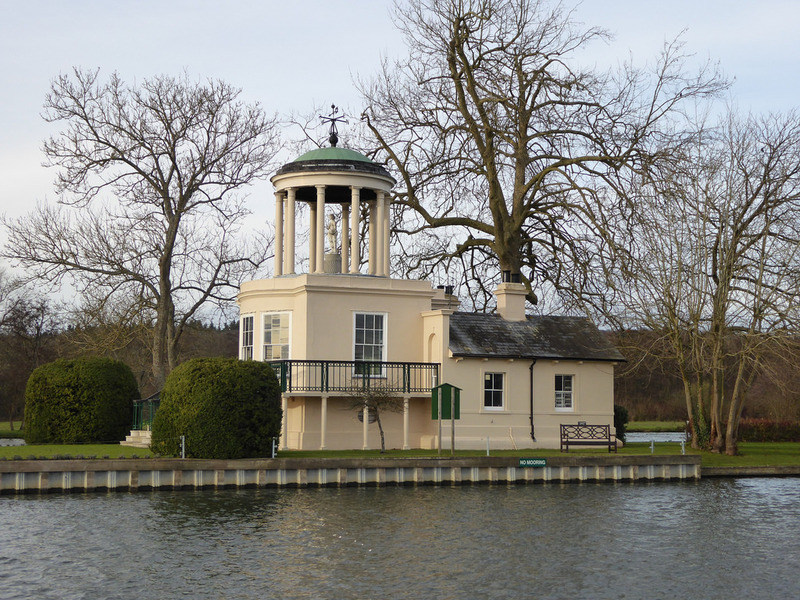 And just beyond, on an island sat a small folly on Temple Island, built in the style of an ornamental temple in 1771. I was now on the home straight; just two miles left until I reached the riverside town of Henley, home of the famous regatta. During the first week of July, the crowds descend on the town to watch rowers compete over the one mile and 450 yard course, which goes along a particularly straight part of the Thames. 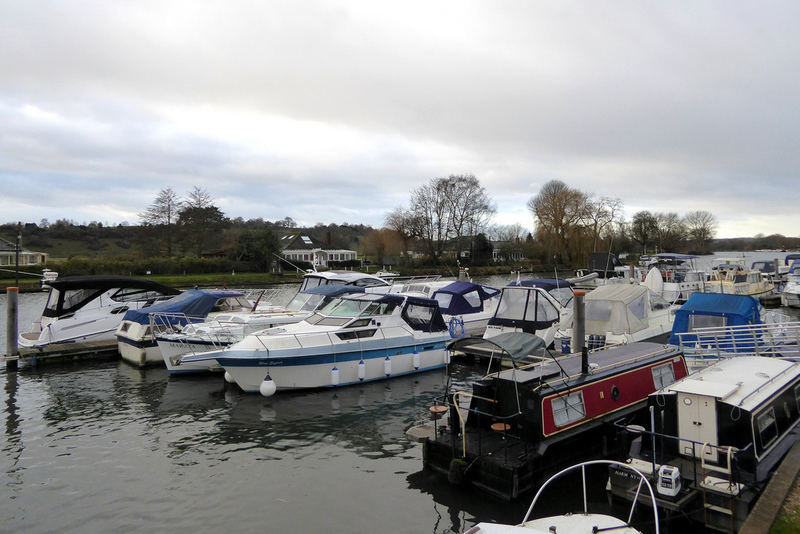 The course starts from Temple Island, and heads down the river towards the town of Henley itself. Attracting racing crews from across the world, it also brings the crowds, many dressed in their finery in order to gain access to the various viewing enclosures, many of which have strict dress codes. The riverbank was lined with rowing and regatta based structures; rowing clubs, outdoor venues and a wall-less metal structure that presumably was turned into a timing point or viewing place during the summer. Indeed, don’t try walking the Thames Path during the regatta; those with walking boots are usually dispatched well away from the river. After all, why should hikers be able to mingle with those in their lounge suits and hats? On a cold December day though, all I had to contend with was the occasional dog walker; some things about the Thames Path clearly don’t change. And then, there I was, about to cross over the Henley road bridge, and into the town itself. As I did, I crossed out of Berkshire and into Oxfordshire; my fifth county of the trail. But further exploration was for another time. I had a train to catch home. It was barely two o’clock, but without my guide book I had no idea where the next train station would be. I also had a fair wait before the next departure so I meandered into the town’s busy market square, and peered through the windows of the posh shops, estate agents, and other sights. Up until 2002 the town had been home to the Brakspear Brewery, and most of the local pubs were promoting the formerly-local ale, which is now brewed 35 miles away in Witney. The brewery buildings now house a boutique hotel, rather inappropriately and disappointingly named “Hotel du Vin.” The closure of the brewery had no doubt taken some HGVs out of the town, but the place still seemed to be completely dominated by traffic, to the extent that even crossing the road was a task of epic proportions. I’d gone wandering round the streets seeking out an independent coffee shop, rather than the ubiquitous chains which seemed to be in the centre of town, but when I did find one, it was on the other side of the road to me, and an attempt to cross to access it was abandoned after I’d spent five minutes waiting for a break in the cars. My last ditch hope of finding some refreshment at the railway station was abandoned when I found out that the café in the station buildings had closed at half one. With half an hour to hill before my train would turn up, I huddled on the cold, draughty platforms, I looked back at the day. Yes, it had started insanely early, had involved another cold, draught station (but one with a waiting room) and I’d spent almost as much time travelling as I had walking, but it had been rewarding. After many miles spent walking near the gardens of large houses, it seemed like the Thames Path was finally about to get interesting again; the river going on a rural exploration. And for the first time in a while I couldn’t wait to see what it would bring up next. Your curiously mowed field looks suspiciously like a cricket field to me. It could be one. It would be roughly the right size. 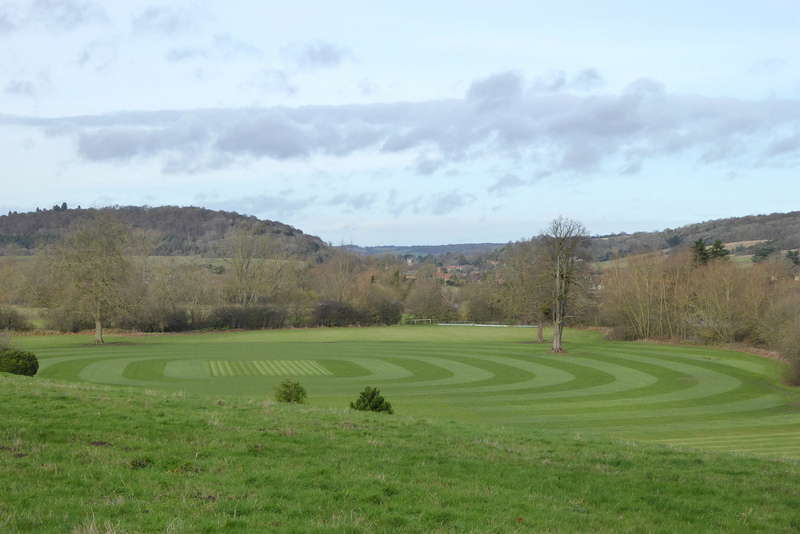 I have just never seen a cricket pitch mowed in that way with concentric circles. There wasn’t any noticeable cricket paraphernalia there, although it was out of cricket season. It is indeed a cricket pitch. We came by today and all the cricket paraphernalia was there! First Published: 14 January 2015. Last Updated: 12 February 2017.